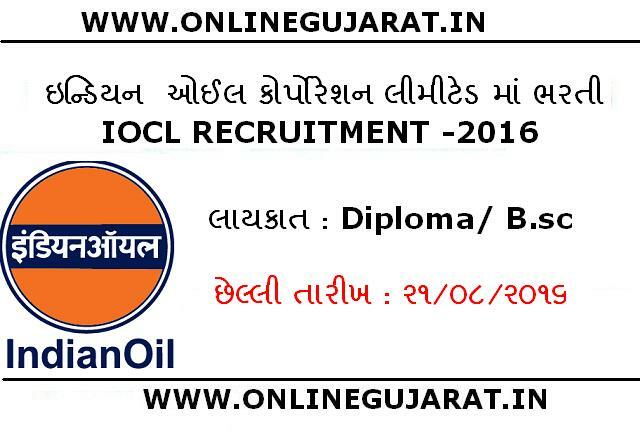 Indian Oil Corporation Ltd. (IOCL),Vadodara, Gujarat Invites application for the post of below mentioned posts. This is a great chance for interested candidates who are looking for IOCL Jobs.Eligible candidates may apply online from 01-08-2016 to 21-08-2016.Candidate is advised to visit official notification before applying for this post. Minimum 3 years full time, regular/sandwich Diploma in Instrumentation/ Instrumentation & Electronics/ Instrumentation & Control. Age Limit : Minimum 18 years and maximum 24 years as on 31.07.2016 (Relaxable by 5 years for SC/ST, 3 years for OBC, for the posts reserved for them). After successfully applying/registration of Online Application, the candidate must take a print out of the filled-in online application and submit the same to Chief Human Resource Manager, Gujarat Refinery, Indian Oil Corporation Ltd., PO: Jawaharnagar, Dist: Vadodara – 391 320, latest by 3rd September 2016. Printout of online application received after last date shall be summarily rejected. Candidates should superscribe the Name of Trade/ Discipline Applied for and Trade/ Discipline Code on the top of the envelope. No other enclosures are required to be submitted at this stage, except for the print-out of the Online Application Form. Starting date for submission of online application : 01-08-2016.